i am a native portlander and have a background in graphic design. i have been making art all my life and through the years i’ve had the chance to explore a number of art forms: ceramics, embroidery, digital art, illustration, photography and painting. currently, my main work is in encaustic, a mixture of heated beeswax and resin. encaustic became my main focus about 16 years ago when i saw it and was curious about the source of it’s texure and depth--i loved that you can create your own color and then build up layers of wax to end up with something multi-dimensional . i started experimenting with it and i was instantly in love with the endless possibilites of the medium. my work can range from graphic, colored, geometric shapes, to more detailed line illustrations of plants, flowers, animals and other elements of the natural world. i find the whole process both exciting and meditative. 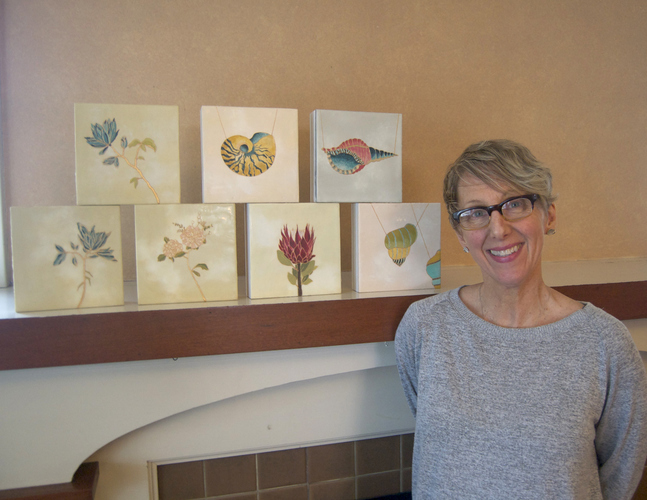 i show my work at guardino gallery, local art shows as well as a number of shops in portland and in manzanita, oregon. i currently live in ne portland with my husband, 2 teenagers, 1 dog, 3 chickens and a garden.